Happy sunny Tuesday! At least I hope you’ve got sun where you are. 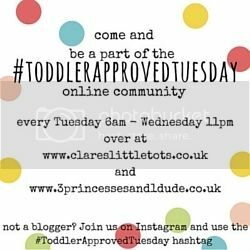 Thank you to everyone that linked up last week and used the #ToddlerApprovedTuesday hashtag across their social media. Last week I took my own two a a lovely walk where we collected lots of wild flowers and when we returned home we made these beautiful Suncatcher Nature Collages that look amazing when the sun shines through on them. My ever amazing co-host Becky over at 3 Princesses and 1 Dude! is sharing her 5 Ways to Play with Dinosaurs because what kid doesn’t love dinosaur play. My favourite post from last week is this Looking for Gold Tuff Spot from LarabeeUK – I love the hidden gold nuggets. You can link up to 2 posts. Tweet us (@clarestots and @3princess_1dude) for a Retweet. I will also pin as many as I can on to the #ToddlerApprovedTuesday board on Pinterest.